On the right is shown a carved 3D HDU wall plaque of a special agent badge, covered with metallic gold and black paint. This plaque is 16 inches high, but similar plaques can be purchased in any size from 16 inches to 60 inches in diameter. It can also be customized with other text or art. Please click on Gallery 33 to see other designs for our carved HDU, wood and metal police, law enforcement and special agent badge wall plaques. 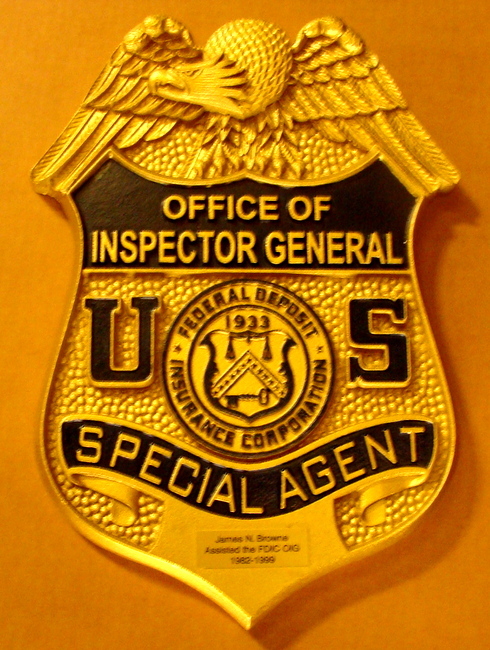 We make custom & personalized metal-coated round, rectangular, shield, and other shape wall plaques of all of the great seals, emblems, logos, badges, medals, insignia, and patches for any branch, department, agency or other organization of the US Federal, State, county and city governments and their various departments, agencies, etc., (especially courts and police/sheriff departments), as well as professional offices (attorneys, doctors, CPAs, etc. ), colleges, companies, stores, cemeteries, memorials, churches, and residences. Please click on Gallery 30 to see designs for Federal government plaques. Our State government plaques are shown in Gallery 32. To see other Photo Gallery pages for badges, including the US military branches (Gallery 31), Counties and Cities (Gallery 33), aand Police and Fire Departments (Gallery 33, page 2), please click on one of the numbered gray boxes in the lower left margin of this page . To see prices or get Estimate and Order forms , click on gray boxes in upper left margin. Click on dark gray tabs on the header to see Home and other informational pages.